I’m sitting at my computer tonight completely exhausted. Yet, completely energized. 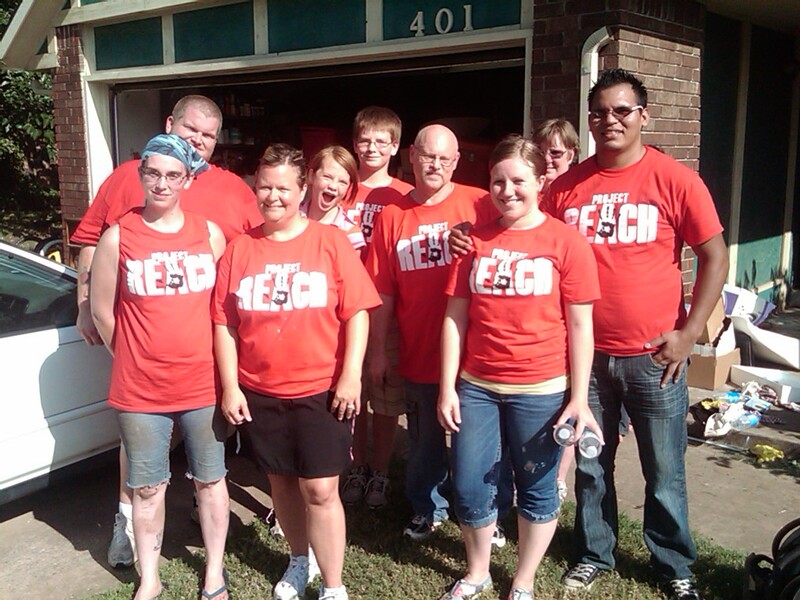 Today Project Reach spread out across BA for our Community Care Project. Three teams reached out and showed the love of Christ to several families in great need. The team I was a part of helped a young single lady who is struggling with health issues and is unable to keep up the outside of her home. The team mowed, edged, raked, planted, and I got a chance to use my chainsaw. Another team painted and helped out Broken Arrow Neighbors at their facility. I was blow away by the team pictured above. They reached out to a family that struggles with hoarding. The task was extremely overwhelming and like nothing I had seen or experienced. What I was not prepared for was meeting Jesus in the kitchen. As I made my way through the small path the team had carved out in the living room I came to the kitchen and was completely overwhelmed by the act of humility and love I saw. There in the kitchen stood Ricardo, Kasey, and Laura scrubbing and cleaning. Not to be over dramatic, but I immediately thought, “this must have been what it was like to be Mother Teresa in the streets of Calcutta.” Everybody admires Mother Teresa, but very few want to actually be her. I just stood there and stared at the three of them and, quite frankly, they were a bit freaked out by the way I was acting. It wasn’t until I got home that the situation made sense to me. That’s about as close to Jesus as I have ever felt. In that moment, those three were Jesus. I truly believe if Jesus were here physically today that’s exactly where I would have found Him. And I today I believe I did. I really don’t know how to explain it or put it into words. But, I felt like I was standing in the kitchen with Jesus. It was an awesome feeling and one I will never forget. It is truly an honor and very humbling to lead and serve along side such an incredible group of people. This is the kind of church I dreamed about when God planted His vision in my heart almost three years ago. For us, this experience left a great satisfaction. i mean, just being there, allowing our bodies to become a living sacrifice for the spreading of God’s love over our community, changed our perspective of how we used to view the importance of serving and reaching out! I just want to thank the team for giving up their time, effort and love to those families in need! Karen is a great woman and we are so thankful to her for allowing us in her house and providing a way for God to bless our lives in many ways! I felt the same way about Patrick, Art and Shawn as they took up the leaky toilet and replaced the wax seal and float mechanism. Super job guys! Makes you want to say, ” Lord is that you?” That is what Mother Teresa used to say when she picked up the prostitutes in the ditches and carried them home to care for their wounds.